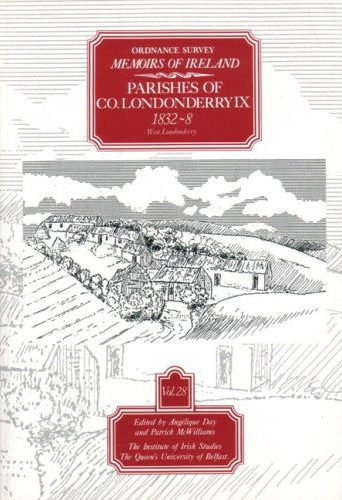 Ordnance Survey Memoirs of Ireland, Vol 28: County Londonderry IX. The Ordnance Survey Memoirs are a uniquely detailed source for the history of the northern half of Ireland immediately before the Great Famine. They were written in the 1830s to accompany the 6" Ordnance Survey maps, but with one exception were not published at the time. In this new edition they act as a nineteenth-century Domesday book and are essential to the understanding of the cultural heritage of our communities. The Memoirs document the landscape and situation, buildings and antiquities, land-holdings and population, employment and livelihood of the parishes. This volume contains the Memoir for the parish of Cumber in the west of the county, an extensive area, including the villages of Claudy and Park, dotted with mills, gentlemen's seats, churches and schools. The material paints a vivid picture of life, greatly influenced by the patronage of the Fishmongers Company, the chief proprietors. Cultivation and productivity are analysed in each individual townland, with model farms prominent throughout. The history of the region documented in townland names and antiquities, while social life comes alive through school statistics, dispensary rules and emigrants' letters. Together this material provides a unique insight into life in this area over 150 years ago.